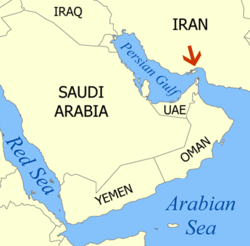 This is the category for the Strait of Hormuz, connecting the Persian Gulf with the Gulf of Oman. Location of the Strait of Hormuz. Pages in category "Strait of Hormuz"
This page was last edited on 5 February 2015, at 23:00.